Wikipedia has cleaned by removing more than 250 user accounts: they are accused of being fake profiles posted by people paid to write articles for the benefit of private companies. A lack of transparency that the online encyclopedia will not tolerate. We may be participatory and free, it is not ready either to accept anything. That may be the message from trying to get the famous Wikipedia site, removing no less than 250 accounts of its platform, auditors accused of not respecting the Charter of the site. 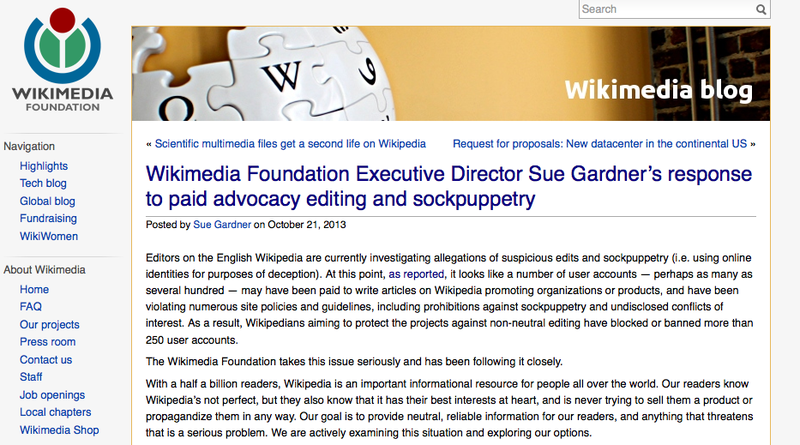 On Gardner, Executive Director of the Wikimedia manager online encyclopedia foundation has even cracked a small post to explain, earlier this week: "It seems that a number of user accounts (...) were paid to write articles on Wikipedia promoting organizations or products, and raped [the charter of use], including prohibiting the use of false statements or that do not declare a conflict of interest. "It is not permitted to write articles being paid, but strict transparency requirements must then be met by the authors. According to a survey of Vice Magazine ("Is Wikipedia for Sale? "), Quoted by Europe 1, there are even companies that specialize in writing such articles. Thus, they can be paid between 500 and 1,000 dollars one with a small bonus of 68 dollars per month to ensure that the page is not removed. The authors of these texts allowing thus be better referenced companies, create fake user accounts to write without arousing suspicion. Other investigations Dayli Dot or Ars Technica have identified at least three hundred accounts associated with these companies, including Viacom, for example (an American media giant) or even the University of Colorado.